This post is for letter “G” in the 2016 ABCs of Homeschooling Through the Holidays series, click here to see all posts. One of the most beautiful aspects of homeschooling, in my opinion, is the opportunity to build incredibly strong families. When you spend all day with each other, learning each others strengths and weaknesses, wants and dreams, you tend to be heavily invested in each others successes. It’s easy to take it all just a little bit too seriously, though, and that’s why a cornerstone of our own efforts here at the Little Learning Lovies house is game night. This is certainly not a new concept, and it’s possible that you already do this in your own home. Today I’d like to share with you some tips for making game night successful and joyful, and ways to make sure you really make time for it instead of putting it off for a week, month, or year! If it’s been a long time since your last game night, I challenge you to make time for at least one during the days leading up to the holidays. When Should You Host A Game Night? If you have very young children, dear reader, you’ll want to host a game afternoon rather than a game night! Little ones are too tired to be gracious in the evenings and rather than fight that, it’s best to time your games for when your sweeties are at their most patient. Games can be hard to learn, and the hardest lesson of all is learning to lose! Other than this consideration, you can host a game ‘night’ anytime! You can plan them out ahead of time, schedule them to be a weekly experience or a monthly treat. You can even call one spontaneously if the mood strikes. In fact, this is a pretty awesome way to reconnect after a busy day or to turn around a day that’s going all wrong. Who Should Attend Your Game Night? I suggest having an official family game night where the whole family is involved. Families with schedule challenges may find it just doesn’t work out. In that case, don’t skip game night! Go ahead and play with whoever is around. If you play frequently enough and vary your timing, there’s a good chance everyone will get in on the fun and the connections that happen. It’s also fun to invite friends over for game nights. We often host a dinner followed by games with good friends and it has really helped us grow in our friendship as we get to know each other better through play. Where Should Game Night Happen? We host ours right in our dining room. The table is big and accomodates everyone (we are a family of 7) and allows for plenty of space to spread out our games. There’s also easy access to drinks and treats, which are a common feature to help make game night even more fun and special! You can host game night in whatever room you’re comfortable or you can even host an epic game night at a large meeting space! A game afternoon at a library or meeting hall would make for a fantastic homeschool group event for the whole family. What Games Should You Play? Every family has their favorites, of course. If you have young children, you should start with a simpler game that they can enjoy before heading off to bed. Older children will enjoy the challenges of harder to learn/master/win games. Here are some of my own suggestions, with Amazon links for your convenience. These would make great gifts for Christmas! 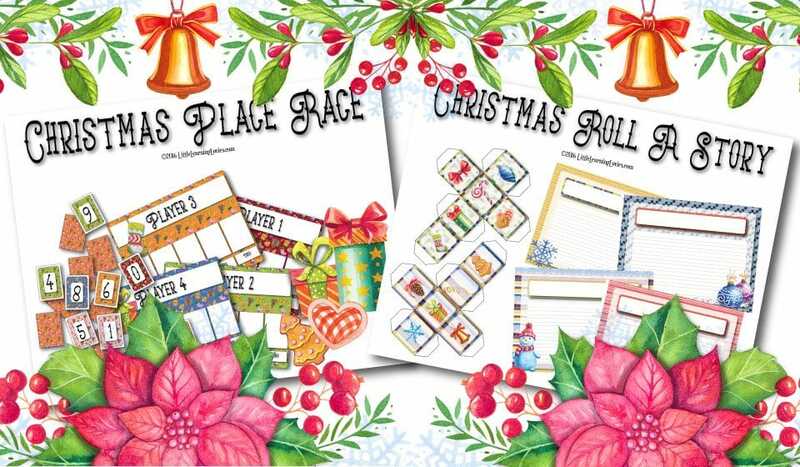 Free Christmas Themed Family Games from Little Learning Lovies! CLICK HERE TO GET YOUR FREE GAMES NOW! 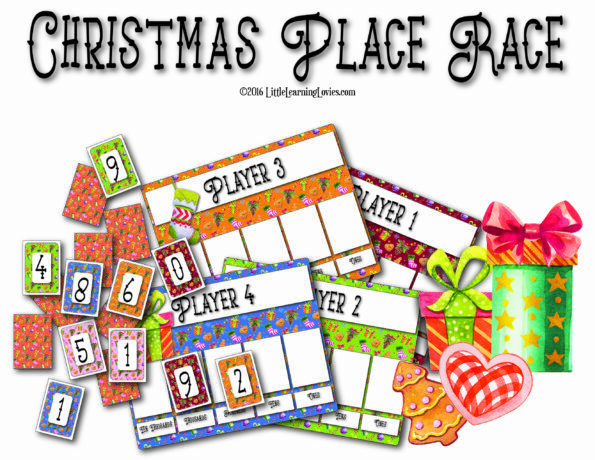 Christmas Place Race teaches about place value, but it’s full of great strategy. It’s quick to learn and easy enough for even a 3 year old to play, but the adults in the room will enjoy the strategy of it. This is a great family game and we sincerely hope you enjoy playing it together. 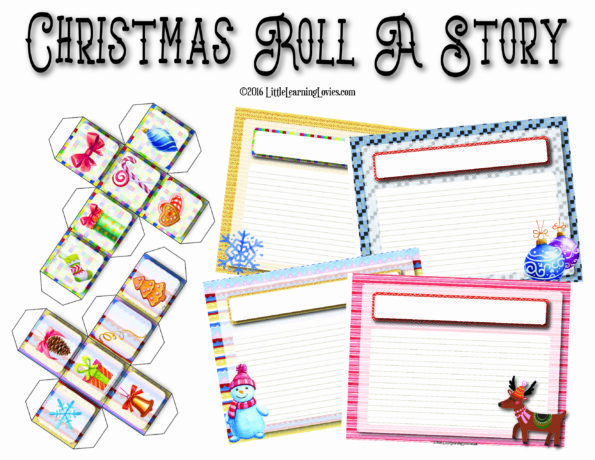 Christmas Roll-A-Story is just plain fun! As you roll the dice, you create the next part of a story using the picture you rolled. You take turns building on the story until you find a conclusion. With so many authors, there’s bound to be some hilarity. Prepare yourself for a LOT of giggling! What are YOUR favorite games to play as a family? How often do you have a family game time? Join 120,000+ homeschooling moms in the Life of a Homeschool Mom VIP email community and receive exclusive freebies, encouragement, and real life, practical advice! Recommended products, just for you! We also have Game Night, though I admit it is only about once a month. You inspire me to do better. Our son is thirteen now and he still loves to invite family over for dinner and follow up with a card game, a game of Scrabble, or Urban Myth. While we don’t do it enough, I agree it is time well spent and it should be cherished! Hi, there! I’m Heather Bowen, and I am so glad you’re here. My passion lies in helping homeschool moms balance marriage, motherhood, homemaking, and homeschooling all while remaining sane!